March 6, 2012 - Lexington Park Loves Mayor Marty Moylan! Moylan gets congratulations from Wanda Brunke, left, and Sarah Elsner, both special events coordinators for the Illinois State Crime Commission. In addition to the great location of Lexington Park (with its abundance of restaurants and recreational choices), Lexington Park homeowners will love our town administration – lead by Mayor Marty Moylan!! 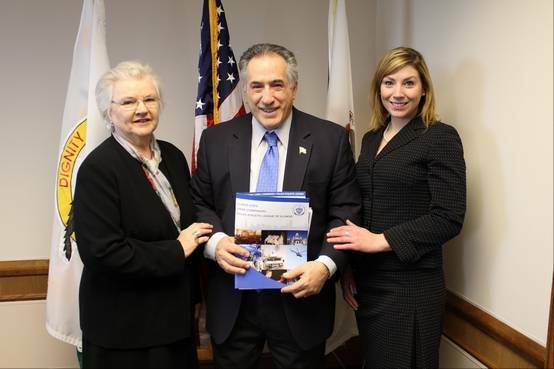 Des Plaines’ mayor, Marty Moylan, was recently selected as the 2012 Municipal Leader of the Year by the Illinois State Crime Commission Police Athletic League of Illinois. He will be recognized at the 16th annual awards night on June 20th. Having lived in Des Plaines for over 25 years, Mayor Moylan has always been involved in making Des Plaines a strong and vibrant community centered on working class family values. Moylan was elected to serve as the mayor in April of 2009. Prior to the mayoral election, Moylan served as Alderman of the 2nd Ward of Des Plaines. Moylan has more than 40 years of experience in the construction industry, specializing in the electrical field. As the former electrical inspector and Deputy Director of the Des Plaines Building Department, Moylan helped transform the department into a user-friendly agency. Currently, Moylan serves as a Business Representative for IBEW Union Local 134. Moylan is passionate in solving the community’s most pressing challenges while creating opportunities in making Des Plaines a world-class suburb. As mayor, Moylan works tirelessly on issues affecting the families of Des Plaines. From public safety policies and economic development initiatives to quality of life issues and government reform, Moylan’s leadership has made a difference for all Des Plaines residents. Moylan actually rolls his sleeves up and gets the job done for the community. Lexington Homes would like to congratulate Mayor Moylan on this outstanding achievement. Way to go Marty!